After more than 30 years, percutaneous stone removal still stands the test of time as treatment of choice for large and/or complex urolithiasis. In fact, instead of becoming obsolete over the decades, percutaneous nephrolithotomy (PCNL) underwent considerable evolution thanks to a lot of technological advances in endoscopic instrumentation and fruitful innovations in surgical skills. The rather recent debate on patient positioning certainly contributed to the new life of PCNL. 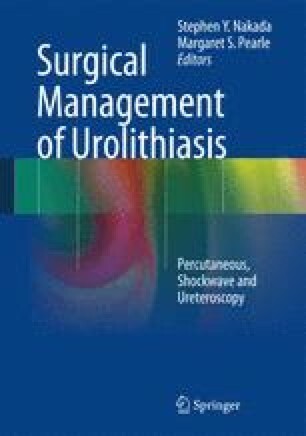 The introduction of the Galdakao-modified supine Valdivia (GMSV) position optimally supports ECIRS (Endoscopic Combined IntraRenal Surgery), a novel combined antegrade and retrograde approach to the upper urinary tract for stone treatment, involving the synergic use of rigid and flexible endoscopes, of various accessories and of different lithotripsy energies, and a synergic cooperation among all the operators (two surgeons, anesthesiologist, scrub nurse, nurses, radiology technician) with the relative armamentaries. This technique implies many anesthesiological, management, and urological advantages. In particular, patient positioning, operating room organization, and the role of retrograde ureteroscopy are described.